If libraries can have friends, why can’t schools? In one part of the Hill Country they do. For all the rural schools that we might see alongside Texas’ highways, there are ten times more that have been demolished, burned, cannibalize for their building materials or are standing in for barns. 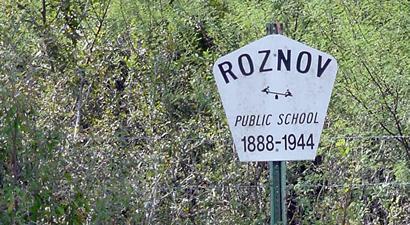 Although it proved to be unfounded, the rumor that “they’re selling our schools” brought together a group of Gillespie County citizens who organized themselves into The Friends of Gillespie County Country Schools, comprised of over 400 members who use the 12 rural schools in Gillespie County as community centers. They are interested in preserving the traditions of the schools, the community clubs, and the history of Gillespie County for future generations. 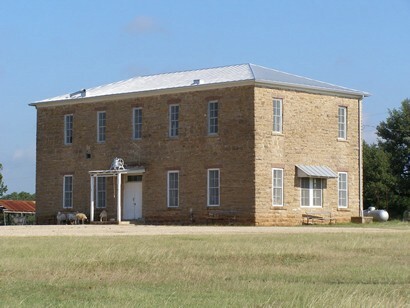 As a result of the passage of the Gilmer-Aikin Law in 1949, ownership of most of the rural school properties in Gillespie County was transferred to the Fredericksburg ISD. After consolidation, community clubs leased the properties, but it became clear that these leases were not a permanent solution to the fear of “selling our schools”. Research quickly identified the only solution: change the law! The Board of Trustees was unable to return these properties to the original communities, because of a prohibition in the law. In Spring, 2000, as requested by The Friends of Gillespie County Country Schools, Fredericksburg ISD dispatched a letter to Senator Jeff Wentworth and Representative Harvey Hilderbran requesting that legislation be introduced, which would allow donation of these properties to a governmental or non-profit organization at no cost. Senate Bill 166 was passed by the Texas Legislature, signed by the Governor and listed as Proposition 13 on the November 6, 2001, ballot. The voters of Texas overwhelmingly 80.45%) approved the Proposition, and the bill became law on January 1, 2002. The Friends of Gillespie County Country Schools developed a timeline and strategies to built grassroots support here and throughout the state. Activities included exhibits at banks, stores, the Gillespie County Fair, and Texas Preservation Day 2001. A series of articles discussing rural education and the 44 Gillespie County school districts were published locally and statewide. A calendar was published in 2001 featuring the 12 schools and was probably the most successful effort to spread the word, with more than 2,000 copies sold. Every opportunity to publicize the story, locally and statewide, was used and included print, radio, television, and the worldwide web. Several members testified before the Texas House and Senate in support of Senate Bill 116. The Friends of Gillespie County Country Schools traveled more than a 1,000 miles to 10 parades with the "Rural School Float", depicting a rural school in the early 1900’s, complete with children and teacher in period costumes and a group of community club members playing “Texas 42”. More than 5,000 postcards were mailed and flyers were handed out on Main Street. Every County Historical Commission received an information packet. The culminating event was the "12 Country Schools Open House and Reunion" in September 2001, which included a BBQ meal cooked on one of the original school BBQ pits. In 2003, The Friends of Gillespie County Country Schools published a calendar documenting 12 additional schools in the county. On April 5, 2003, and every first Saturday in April thereafter, an "Open House" is held as part of the fundraising effort. The efforts of The Friends of Gillespie County Country Schools to preserve their schools, their community centers, and their traditions are an outstanding example of what a grassroots movement can accomplish. The goal set in May 1999 has been achieved, but the work toward preservation is just beginning. In 2002, The Friends of Gillespie County Country Schools received preservation awards from the Texas Historical Commission and Preservation Texas at the Texas Preservation Day in Abilene, Texas. 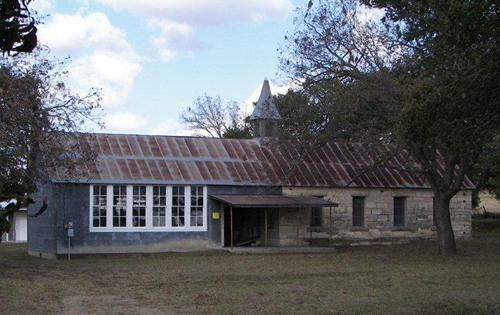 In 2004, The Friends of Gillespie County Country Schools officially became a non-profit organization (501(c)(3)) and are working on raising funds to improve, renovate, and preserve the 12 properties. Topping the list are updating the restroom facilities and bringing water to seven of the 12 properties at an estimated cost of $100,000.00. Donations are accepted and greatly appreciated. In January 2005, the Texas Historical Commission approved and forwarded our application to place the 12 properties on the register of National Historic Places. In April 2006, during our annual celebration, Larry Oaks, of the Texas Historical Commission, presented the National Register plaques to the representatives of the 12 former schools and officially opened the Gillespie County Country Schools Trail, a first in Texas. In December 2006, the Gillespie County Historical Society recognized the efforts of The Friends of Gillespie County Country Schools by presenting the Star of Texas award. The Williams Creek School, aka the Albert School, was once attended by a young Lyndon B. Johnson. 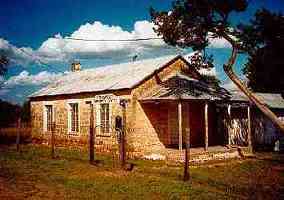 "The Grapetown Schoolhouse to the right and the back of the teacher's house to the left."